Running Calgary, Alberta. 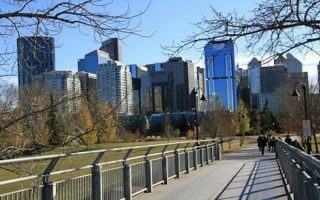 Best routes and places to run in Calgary. 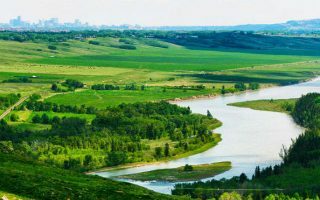 Calgary is a fast-growing city situated at the confluence of the Bow River and the Elbow River in the south of Alberta. It’s home to the second-highest number of corporate headquarters in Canada, with the oil and energy industries a major growth engine. 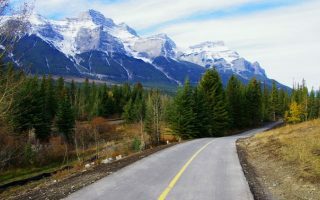 Legendary Banff and Jasper National Parks are a couple of hours away by car. 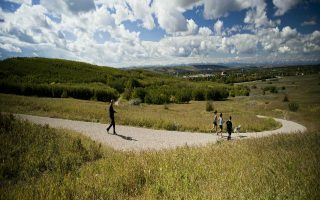 This is a guide to the best places to run in Calgary. The city has among the the most extensive urban pathway and bikeway networks in North America, especially for a city its size. 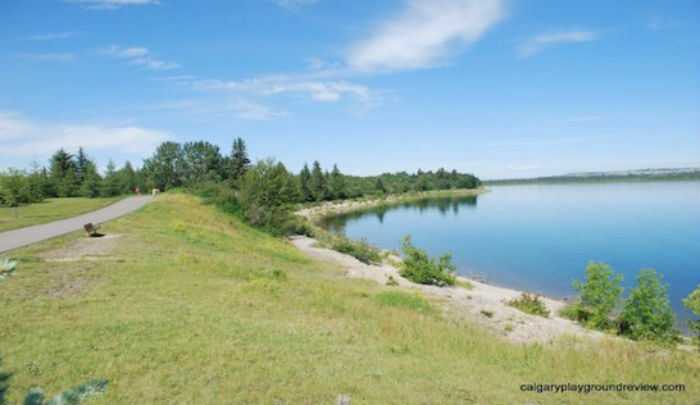 There are boundless running opportunities on the 800 km of pathways that connect along the Bow and Elbow Rivers, Fish Creek Provincial Park, Nose Creek, West Nose Creek, the Western Irrigation District Canal and the perimeter of Glenmore Reservoir. Calgary Transit provides public transportation services throughout the city with buses and a light rail (LRT). If you’re staying within downtown, it is practical to use public transit to get around and access some great running. However, some of the wonderful running areas outside the city are best reached by car. The airport is about 14 miles north of the city. The pathways along rivers are the signature running opportunities near downtown. Wonderful, open scenery, with views of the mountains on a clear day. Various loop options. Extensive trail system in this hilly park 5 miles north of downtown. One of the most significant examples of the grassland ecosystem left on the Canadian prairies with great vistas from the plateau. Marda Loop is one of Calgary’s most popular outdoor shopping venues. This is a great city run with lots of sights and good people watching, restaurants, coffee houses, and businesses. 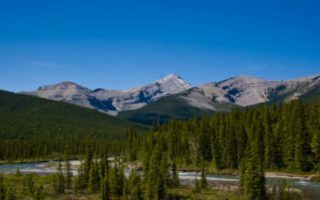 Situated in the foothills of the Rocky Mountains, Bragg Creek is a charming hamlet about 30 minutes west of downtown Calgary. Extensive trail network with many running options. 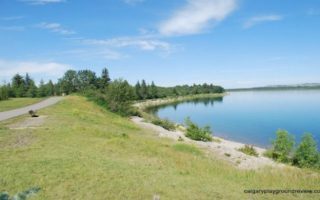 3200 acres or ranch land 30 miles west of Calgary, with gorgeous views of the snow-covered Rocky Mountains, the Calgary skyline, and an active ranch with cows and horses. 15+ miles of well marked trails. 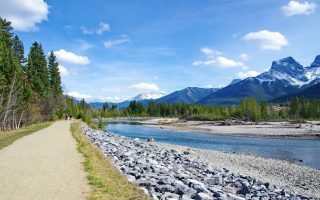 Between Calgary and Banff, Canmore is a mecca for everything outdoorsy, from mountain biking, bouldering, peak bagging, skiing and of course trail running. Great paths along the river -- we recommend 4 mile Three Sisters Pathway. Paralleling the Trans Canada Highway, built in honor of Banff National Park’s 125th Anniversary. A gorgeous, relatively flat trail with fabulous views, popular with runners and cyclists. The southern terminus of the trail is at the Alberta Visitors’ Center in Canmore. Calgary is one of Canada’s sunniest cities with just over 332 days of sun. Winters are cold but tolerable, with average highs close to freezing. Winter nights are cold and the days are short. “Chinook winds” can warm things up dramatically, even in winter. Summers are warm and sunny but not overly hot, with long days due to the northern latitude. Evenings are cool and even in July you might need an extra layer for that early morning run. The city receives an average of 16.5 in (418.8 mm) of precipitation annually. There is snow in the winter, but not nearly as much as Montreal or some of the snowier U.S. cities since the climate is fairly dry. But you will have to be prepared for snowy and icy surfaces for running in winter. With the sun and cool temperatures, Calgary’s climate make for great running weather. Most hotels are located in downtown Calgary. This is a business-oriented zone with a neat historic pedestrian mall and great access to the light rail (LRT). Directly to the north of downtown on the shores of the Bow River, is Eau Claire. A mix of shopping, restaurants, hotels, a large public plaza and urban parkland make Eau Claire one of Calgary’s most popular areas. 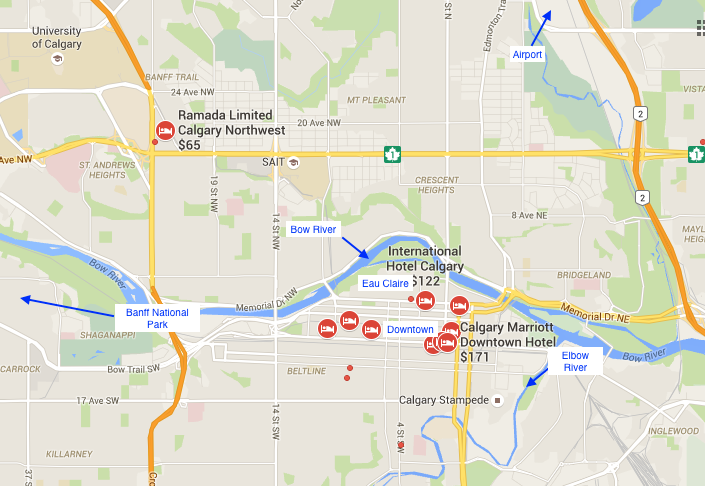 Downtown and most of the hotels downtown provide good easy access to the Bow and Elbow Rivers Pathways, as well as the Marda Loop routes. Gord’s Running Store Crescent Heights. Locally owned running store. Calgary Frontrunners Meets Saturdays 9am at YMCA Eau Claire. The Running Room Various Locations. Group runs are hosted from all Running Room locations on Wednesday evenings (contact your local Running Room for further details) and Sundays at 8:30am. The Tech Shop Alberta’s original running and walking store, dating to 1975. Locations downtown and Calgary north. Strides Running Store Marda Loop and Fish Creek Locations. Free group runs offered Wednesday evening and Saturday morning (see website for details). Calgary Road Runners Club Visitors are welcome to join group runs. Get in touch with the facilitators, to confirm timing and routes on specific dates. There are lots of great running events in Calgary! Calgary Marathon May. Marathon, Half Marathon, 10K and 5K. Stampede Road Race July. Half Marathon, 10K and 5K. St. Patrick’s Day Road Race March. 5K and 10K. Supports the Calgary Roadrunners and the Canadian Diabetes Association.